Spring has finally arrived, and there’s no finer way to cast off the shackles of winter than by giving your vehicle its first full and proper cleaning of the year! There’s nothing quite as satisfying as washing away an entire season of dirt and grime. Since April is National Car Care month, it is a great time to give your vehicle the deep cleaning it deserves. 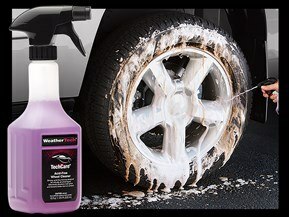 To help you get the job done the right way, WeatherTech offers a full line of auto cleaning and detailing products. After driving your vehicle all winter, your rims and tires can accumulate a ton of dust, dirt, salt residue, road grime and more. So, it’s important that you use the right cleaner for this job. 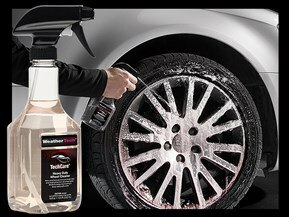 TechCare Acid-Free Wheel Cleaner, and TechCare Heavy Duty Wheel Cleaner are two excellent choices depending on how deep of a clean your wheels require. 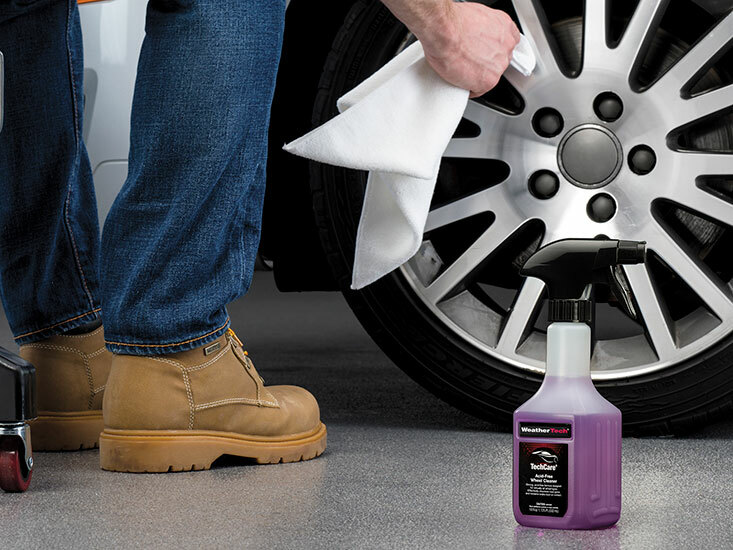 The Acid-Free Wheel Cleaner is a fast acting spray that dissolves grease, road grime and dust from all wheel types. The Heavy Duty Wheel Cleaner is used to clean extreme dirt, grime, dust and more from all wheel and rim types. Before applying the cleaner of your choice to your wheels, start first by spraying them down with your hose. Preferably using a higher pressure attachment or setting as this will help wash away any loose dirt or debris. Then spray the entire surface of the wheel with your cleaner. Give the cleaner a minute or two to break down dirt and grime before using a soft-bristled detailing brush to scrub away the remaining mess. Make sure to focus on any of your wheel’s recessed areas, as these are where most of the dirt tends to accumulate. Once you’ve thoroughly scrubbed your wheels, rinse the area with your hose. Keep spraying the area until the water runs clear, so that there’s no remaining cleaner or dirt to be washed away. Dry the wheel using a microfiber cloth to make sure no water spots or streaks form. 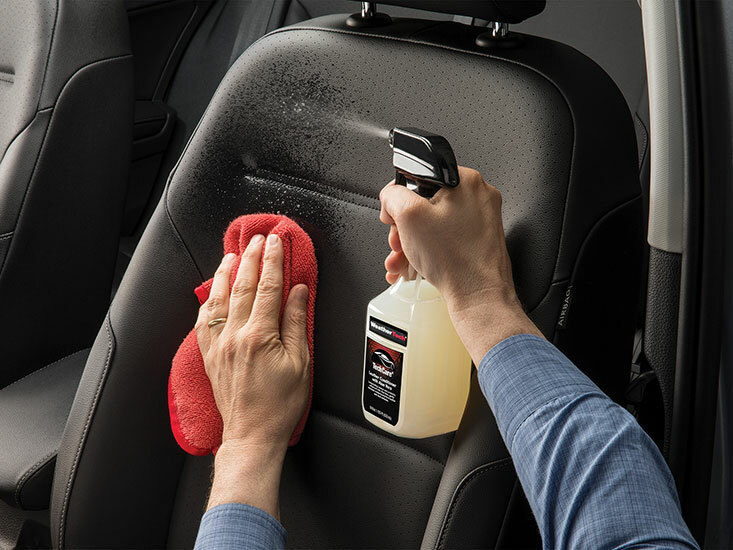 For your convenience, WeatherTech offers a selection of different types of Microfiber cleaning cloths and drying towels, don’t forget to pick them up with all your other vehicle cleaning supplies! 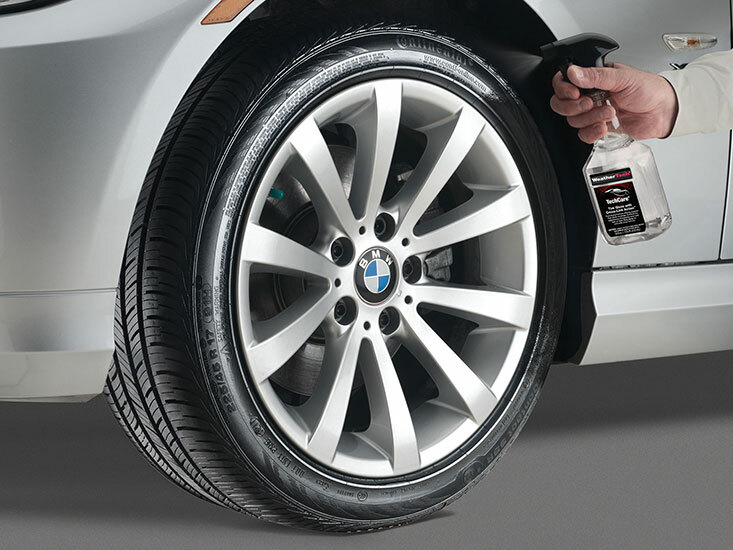 After your wheels are dried and cleaned, add some shine to your tires for that final touch. 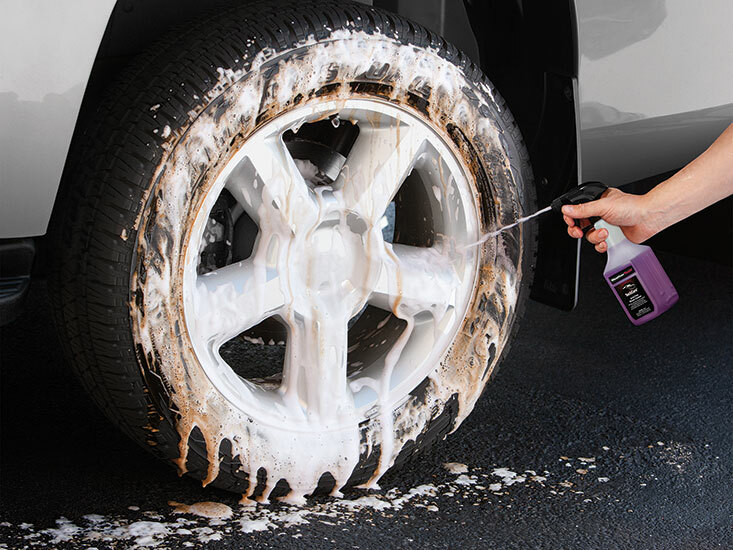 TechCare Tire Gloss with Cross-Link Action provides the perfect "finishing touch" high gloss finish to your tires that will keep them shining like new through several washes. Giving your vehicle’s interior a deep cleaning after a long winter can feel incredibly satisfying. Start cleaning your interior by removing all the trash and/or clutter from the interior of your vehicle. At the same time you can also remove your vehicle’s floor mats and shake them out to remove any loose dirt and debris. 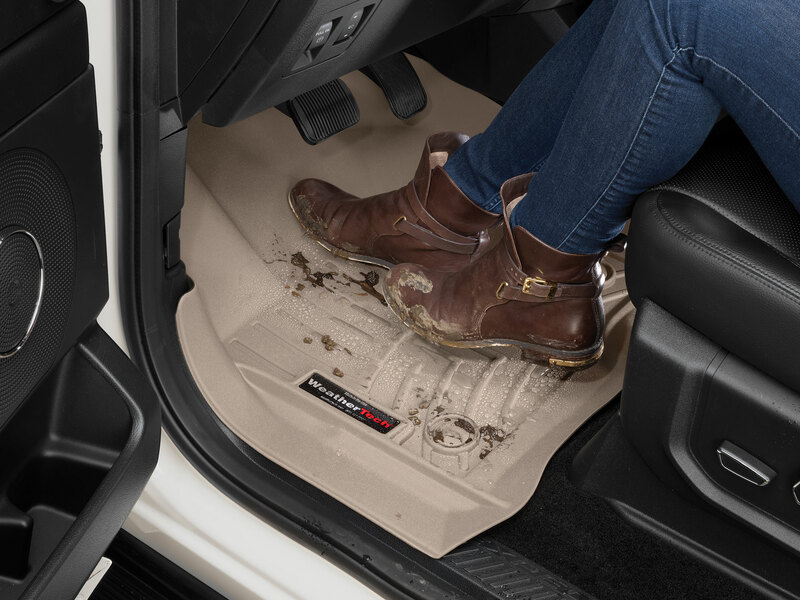 If you have WeatherTech FloorLiners or Floor Mats installed, you can read How to Clean WeatherTech Mats for an in depth cleaning guide. After you’ve removed any trash or debris from your vehicle you can start dusting the hard interior surfaces. 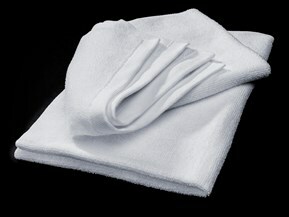 We recommend using a damp microfiber cloth to gently remove any loose dust and dirt from your dash, door panels, etc. After you’ve dusted off all the hard surfaces, it’s time to start up the vacuum! Make sure to use a soft brush attachment on the vacuum, as that will prevent scratching or damaging any surfaces. Vacuum your seats, the floors, and if you have carpet floor mats make sure to vacuum those thoroughly as well. Removing all of the dust and vacuuming your car before using any cleaners, conditioners, or polishes will make them more effective. After your vehicle is dusted and vacuumed, it’s time to break out the cleaners and cleansers. 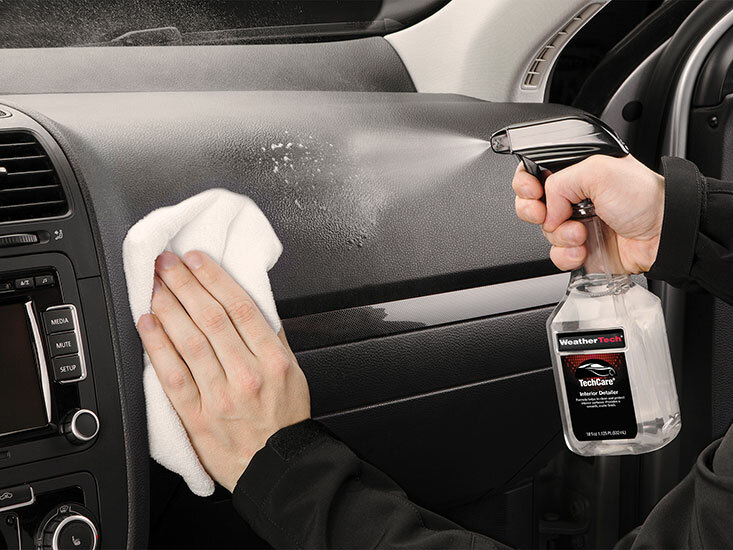 For your dash and other hard interior surfaces, we recommend using our specially formulated TechCare Interior Detailer. Interior Detailer is designed to easily clean all vehicle interior surfaces without causing any harm. Engineered with a neutral pH level, this product will clean away any lingering dust and dirt without harming plastic, vinyl, painted metal, chrome and/or fabrics. Simply spray Interior Detailer onto the surface you wish to clean, then wipe away with a damp cloth and allow the area to dry. TechCare Interior Detailer leaves behind no sticky residue and helps prevent future dust and dirt build up. Please note: If you’re using a cleanser other than TechCare Interior Detailer, make sure to follow the directions provided. Misuse of an interior cleanser could potentially lead to damage or staining of your vehicle’s interior surfaces. If your vehicle is equipped with leather seats, it is important to apply a conditioner so they don’t wear down and suffer irreparable damage as a result. 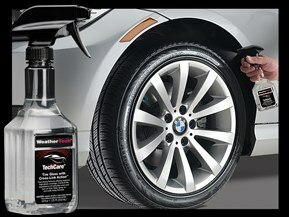 The TechCare Leather Conditioner with Aloe Vera is the perfect product for the job. It gently cleans and removes dirt, dust, and other impurities from leather and vinyl surfaces without drying them out. The Aloe Vera and other moisturizers help extend the life of these materials, and the conditioner protects against spots, stains and UV damage. 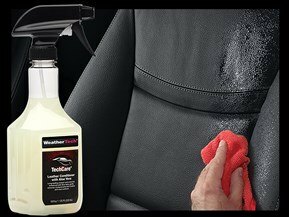 Super easy to use, just spray TechCare Leather Conditioner with Aloe Vera onto the surface and wipe away using a clean and soft microfiber cloth. Last but not least is your vehicle’s interior carpet. While often overlooked, it’s important to clean and maintain this area of your vehicle. Built up stains that accumulate over time can result in heavy damage to your vehicle’s carpet. 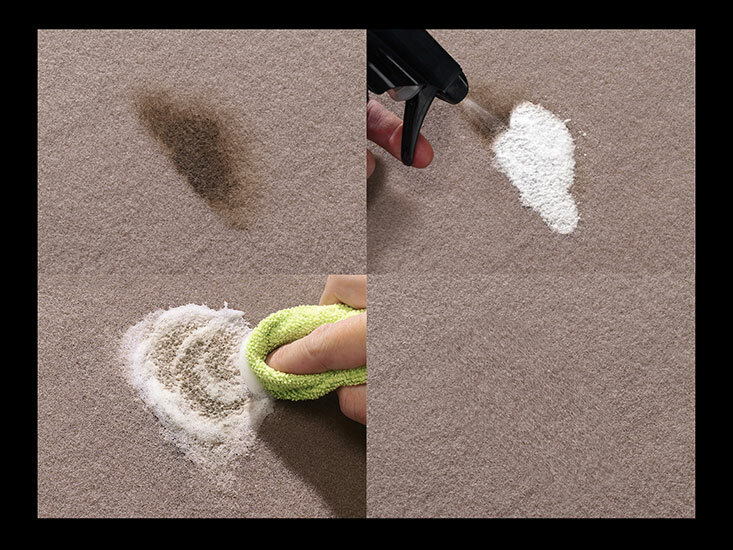 TechCare Carpet Cleaner with SpotTech makes this task a breeze. Its safe and environmentally friendly formula removes organic and inorganic stains from virtually all automotive carpets and cloth interiors. It also works to help repel future stains. To clean your vehicle’s carpet with TechCare Carpet Cleaner with SpotTech, just spray over the area you wish to clean, and scrub with a soft bristle brush or a clean cloth. 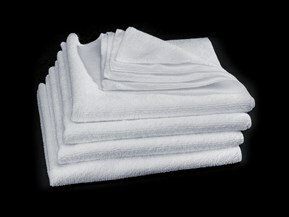 Use a dampened clean cloth to remove any residue after the carpet has been scrubbed clean. You can also use a wet-dry vac for a more thorough cleaning if desired! 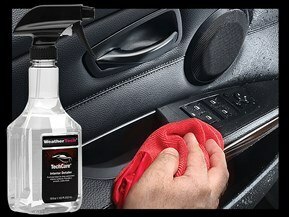 WeatherTech has everything you need to effectively and efficiently give your vehicle a deep cleaning. Make sure to visit our TechCare Page for these products and plenty more! 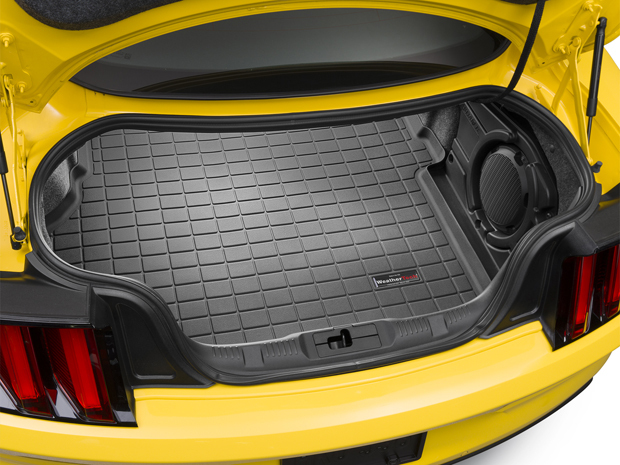 How to kick the new year off with a newly cleaned and organized trunk.